Witnessing and - or Evangelism? It has been noted that history is written by the victors, not the vanquished. However, when it comes to writing textbooks for our schools and universities, history, it would seem is usually written by the politically correct liberal elite. It has been noticed for some time now that a historical revisionism has been taking place in our school's history books with a shift in emphasis. The founding fathers, being white mainstream fellows, were heavily edited in favor of history that highlighted women and minorities of note. And then there was the religion issue. With an increasingly pluralistic nation highly sensitive about offending anyone about anything, and with the ACLU valiantly attempting to erase any connection between faith and the nation, matters religious were also quietly edited out of history as if they were really only fringe moments of passing interest anyway. A recent AP article by Richard N. Ostling, however, gives the impression that the recent publication of a new college-level textbook may be a reversal of this trend. 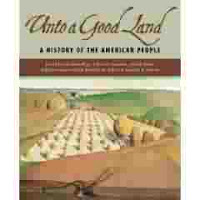 "Unto a Good Land: A History of the American People" (2005) was a 10-year effort by six historians and 50 consultants to produce a history textbook that is, as they say, "carefully non-sectarian," and specifically geared at the college and university level, secular or not. Historian A.J. Scopino of Central Connecticut State University notes that this book is "a splendid work of social history wherein religion earns its proper place." Still, Ostling admits, this book will be a "tough sell at secular universities." I agree. To admit that religion played a part in the history of this nation would be running headlong into a wall of resistance from the anti-religious power brokers in today's educational circles. As with evolution, modern day scholarship has tried hard to explain everything without having to resort to any reference to God, church or religion, even though any serious (and truly honest) student of history would be duty-bound to admit that much of the history of our country has real connections with matters of faith. In checking Amazon.com, though, I was surprised when I didn't find any reviews of the book, positive or negative. It's been out since September 2005. Perhaps silence is criticism enough? Personally I'm pleased to see an honest effort at producing a textbook for this level that restores a balance to historical inquiry. As homeschooling parents my wife and I noticed long ago that older history books were to be preferred over more recent ones, due in large part to the revisionism I referenced before. Thus, we have quite a collection of what I consider one of the premier history readers for pre-teen junior high students: The Landmark series, originally published, I believe in the 50's and 60's. There are over 100 volumes in this series (a few of which have been reprinted), and they cover many of the 'landmark' events of human history. The publisher of this newest textbook, I noticed, is Eerdmans, of which I have many volumes in my library from this same publisher. Unfortunately, I have known Eerdmans to be primarily a religious book publisher, and while that does not bother me, I fear that it will be avoided by those in more secular circles who will hold their publishing emphasis as suspect to their objectivity.